Plowboys BBQ was founded in 2001 by Todd Johns and Randy Hinck, who spent many years competing on the competition trail as the Pork Pullin' Plowboys. In 2009, the Plowboys BBQ Team topped the ranks of the American Royal Invitational and earned the title of World Champions. 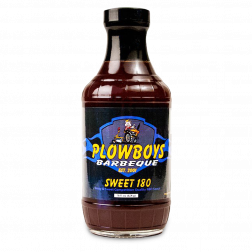 Start barbecuing with the same award-winning BBQ sauce as the Pork Pullin' Plowboys, many BBQ teams in the competition circuit have already been using this BBQ sauce to win, even backyard barbecuers are serving up mouth watering meals. For those looking for a spicy BBQ sauce, the Plowboys En Fuego is recommended. BBQ fans who prefer a sweeter BBQ sauce will love their Sweet 180 flavor.